Those of you who have been reading my nonsense for a while now, will know that I live with Rheumatoid Arthritis. I say, “live” and not suffer, because I don’t really suffer. It’s a part of my life now, and I just have to get on with it. It is painful at times and there are days I am so tired I can’t get out of bed, and days I am in so much pain I can’t move, but there is no point in complaining. It is what it is. For those who aren’t familiar with RA; it is an auto immune condition where my white cells decide to attack my healthy joints and tissue because they mistake them for foreign bodies. This results in inflammation and swelling of my joints and ligaments rendering me immobile at times. The first few years of my life with RA, I was resigned to the fact that I will forever be on strong medication and constant doctor care. However, in recent years and mainly because health insurance at my husband’s work was so terrible, I was prompted to research alternatives to medication. My main focus was on diet and food. A few years ago, before I moved to Colorado, I went gluten free. That was a great step for me and helped me immensely to lose weight and straighten up my diet. The key to the weight loss was definitely not resorting to shop bought GF treats and sugar. I just gave up eating desserts and concentrated on fresh fruit and vegetables. The years of sitting around and watching Food Network and then hours of making all those Food Network treats, just melted off and helped my joints incredibly. Then the move to Colorado happened and all the stress of moving and trying to eat GF while travelling was impossible. Since then, I’ve been GF on and off but I have to say that ever since I started this blog, it has been difficulty to be 100% GF. There are just too many things I want to make, share and eat! This Tomato and Herb Cheese Tart was my first foray into GF baking. I made a couple of different GF tart pastry and though both of them were liked by my family, one didn’t pass my test. So, after I have tweaked that one a bit more, I will share it. Meanwhile, this one was made using a ready made GF flour mix by Arrowhead Mills. For first time GF bakers, it’s a good thing to start with a mix and get a feel for the different texture of the flour and then experiment with different GF flours. Most GF flour mixes come complete with everything you need to replace the flour in your recipes with GF flour 1:1 and they work pretty well. The tomatoes looked great at the store last week so I decided to make a summery tart for lunch with tomatoes and herb cheese. I used a container of garlic and herb Allouette cream cheese. Any creamy, herbed cheese can be used. I like Allouette because it’s GF and has only a few ingredients, so its pretty natural. A creamy herbed cheese custard tart topped with fresh tomatoes baked in a gluten free tart. Using a food processor, process the flour and butter together until you get a bread crumb texture. Add the egg and start with 5 tablespoons ice water to make a dough that comes together. Tip out onto a counter and knead the dough until it holds together. Add extra water if it seems too dry and has trouble holding a ball shape. Flatten the dough into a disc and cover in plastic wrap and chill. Let chill for 20 minutes. Don't try to roll out cold dough. Let soften at room temperature if you chill longer than 20 minutes. Roll out between parchment or plastic wrap to 13"
Using the parchment, gently glide the pastry into the tart tin. If it breaks and it probably will, just patch it up. Chill the pastry in the freezer for an hour or two or even over night. In a medium bowl, beat the eggs, herb cheese, half and half. Take out the GF pastry from the freezer. Pour in the egg-cheese custard. Place on a baking sheet and bake for about 10 minutes or until the custard is almost firm. Take out of the oven, and place the tomatoes on top and sprinkle with Parmesan cheese. You can also cook the tart all the way and then add the fresh tomatoes if you don't want to cook the tomatoes. Here, the tomatoes are still juicy but are cooked slightly. You can even broil the top for a few minutes to brown the crust and char the tomatoes. Remove the tart from the oven and cool on a rack. Along with doing GF the last few days, I have been looking into GMOs (genetically modified organisms) and their effect on our health. I have to admit; what I have found is quite disturbing and the biggest issue is, that they are in EVERYTHING we eat and they are not labelled. Basically, someone decided that they would approve this and feed it to us without telling us about it. I have a problem with that. I am not going to go on about it because not everyone is interested. All I will say is that in the US, all corn, all soy (except organics), Canola oil, sugar (except cane sugar) is genetically modified. UK and EU require the GMOs to be labelled but they have banned most anyway. I don’t know about Australia. Pick up a pack of anything in the US and you will find corn and soy, be it corn starch, HFCS or corn oil or soybean oil, soy lechitin; all GM. All beet sugar in the US is GM so unless it states that they are using organic sugar or cane sugar, the sugar is GM. The health issues are apparent, we have an increase in allergies, food intolerances, autism, auto immune conditions, digestive and stomach problems. If you are interested in learning more about GMOs and their effects and what they are and what foods include them, you can check out these informational sites. Non-GMO Shopping Guide : a list of companies that have committed to not using GMOs in their products. A great blog about real food by Real Food Girl:Unmodified her FB page has great information and updates. One of the problems of an auto immune condition such as RA, is something called a “leaky gut”, where food can damage the intestines and leak bacteria into our system. We then get painful inflammation and flare ups because of this leak and the immune system goes into over drive. I hope this makes a difference for me and I can reverse my RA, here’s to eating clean. I may even be able to go back to eating gluten without fear. I am a science person and I am all for experimentation and knowledge but I would like to have the choice to participate in experiments. Genetic engineering has great potential but only if its safe. If it causes harm to humans and animals, then I don’t want any part of it. I hope you are all having a great weekend! I also hope you found this post useful and not preachy in any way. I will keep you updated on my results with this GMO free experiment of mine. Happy Saturday and beginning of summer! We are quite close I think. I’m Broomfield, right off of 36. Very informative post, Nazneen. I’m sorry about your RA, but keep the positive attitude going. Love the tart and the photos! Basil and tomato is a killer pair. Thanks Lail! Most def, tomato and basil! I think every little bit we can do to eat healthy helps our overall health. 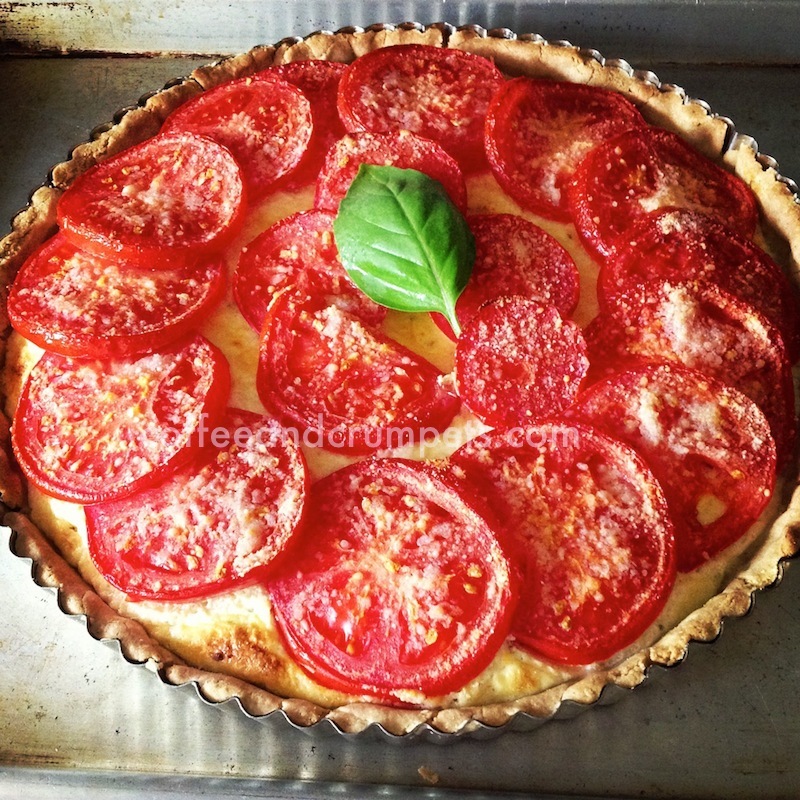 Your tomato and herb cheese tart is beautiful…I can’t wait until I have ripening tomatoes in our garden. Thanks Karen and I agree with you. It’s sad though that we can’t just pick up anything with any sort of confidence. Hey Nazneen. I don’t why this post didn’t visit my inbox. We seem to have problems sending each other stuff from time to time. I’m so sorry to hear of your plight. Your attitude is excellent, as I get older the one thing I appreciate is my health and fitness. I have a slightly dodgy big toe which annoys me from time to time, I can’t imagine how you must feel with this constant pain all over. I wish you good luck. Also we spent a month on GF last year when my wife was having a few problems, turned out to lactose sensitivity. So I also appreciate how difficult GF is. I could never eat sugar again and cope, not eating gluten again though……. David Crichton recently posted..Dim Sum and Gyozas. Thanks Dave, I don’t know what happens to these emails, its hit or miss I think! Thank you for your comment, I appreciate your words. GF is very difficult for me but I know I feel better without it, not so much for RA but for feeling light and energetic which is desperately needed when you have joint conditions. I didn’t know…..I am so sorry for your RA and thank you for sharing the details. The tart looks delicious, and coming from your kitchen I know it is bound to be awesome! Minnie@thelady8home recently posted..Cascade Platinum Dazzles!! I must say I was unaware of so many of the things that you mentioned here. Thank you so much for bringing it up. Sorry to read about the RA and glad that you found a diet to deal with it. The tart looks delicious. GF or not, I would have happily eaten the whole thing. Take Care Nazneen! lovely photos! making me hungry so early into the morning! Thanks milkteaxx!! Its great for breakfast…I had the last leftover piece for my brekkie. The pastry sounds incredibly rich and flaky…love that it’s gf (would’ve never guessed)! Thanks Angela! It was pretty good for GF! We all need to understand that there is a difference between Rheumatoid Arthritis and Osteoarthritis. I know that what you have is the worst. I hope all your efforts give real and lasting results. I often have very bad muscle and joint aches, too. They come and go seemingly without reason. So…I am also eating gluten free (until I HAVE to have a slice of toast, that is, or a tortilla!) I have also given up my three glasses of milk a day and have found that I’m OK with that. I drink 2 T. of Bragg’s apple cider vinegar in a glass of water every day but have not really noticed any benefit from that yet. I really do think that potatoes and peppers play a big part in my aches and pains. It’s hard to totally give up those foods and tomatoes, too. Peppers and tomatoes are in lots of our favorite recipes. I really believe that most of our health problems have evolved from eating the foods that have been changed over the years without our noticing or knowledge. The saddest part is it’s all for profit. That is why 12 years ago we moved out in the country and have a garden (although it doesn’t provide nearly enough for our needs) raise chickens and pigs. It’s a start, anyway. Thanks Caterina! That’s all we can do right? Just try and get through as best we can. My father has arthritis too so I’m kind familiar with what you are going through.But you are so positive about and that positivity radiates in what you are cooking and your photography. I’ve just started on my “health journey” myself because I’m really overweight… and it’s hard because yo really have to choose your food and make it a lifestyle! My wife and I are also very concerned about GMO in this country and the quality of the food products being sold to Americans. We attempt to maintain a strict organic code for the foods we buy and actually sources more than 80% of our foods from local small farms…not everyone is so lucky though. Hopefully there will be a day when a few politicians have the courage to lead and forceably change labeling and what is considered real food. …oh btw, thanks for the visit to my site and I’ll be sure to place you in my reader. Cheers! Sorry about your arthritis – I didn’t know you suffered from it. It can be a painful disease, and probably losing weight was the best thing you could do – less stress on joints, etc. My wife has some (fortunately fairly minor) and she finds an Excedrin or two a day quite helpful. Anyway, lovely tart! Our backyard tomatoes aren’t nearly ready yet, but I’ve been seen OK tomatoes in the supermarket lately. This is something I should definitely try – thanks. Thanks John! I have it under control with some very strong medication and also take an over the counter or two as need arises. I bet this tart would be excellent with garden fresh tomatoes! great post 🙂 Looks delicious for gluten free. I struggle with gluten free cooking! Taking control of what you eat is the first few important steps. I’m glad you are finding solace through GF and equipping yourself with GMO knowledge. It’s apparent that our food industry these days are all about profiteering and doesn’t encourage healthy and fresh eating habits. I could eat my weight into that delicious tart! Yum!! I love pies and tarts so much but there are no eaters in my house so I usually make one small for myself or sometimes buy from a store. This just look amazing and I want to try it. On the other note Nazneen, Its good to know that you are trying to reverse the effects of RA by going gluten free, giving up sugar and eating the right foods.Healthy diet is always a defense against health issues which is hard to follow but not impossible. I try to buy products that says GMO free and sometimes go to different stores just to buy one single thing that says GMO free. I use corn and soy flour for chapatti unfortunately have yet not found any of these flours without GM. Thank you Balvinder for your sweet words. You must make a small one for yourself! It was quite good. ChgoJohn recently posted..The Bartolini Have Hit The Road! Thanks John! I agree with you, I think our diet has a lot to do with our health. I’ve never been an unhealthy eater, just had a love for bread unfortunately, but I really believe the hidden GMOs have caused my illness somewhat at least. But who knows really? Just watch what I eat and take care of what I can. All that aside, this tart was quite good! Thanks GG. I am hopeful that eating non GMO and organic will give me some relief but who knows? I have learnt to live with it now. The tart was wonderful with the fresh tomatoes. I am sorry to hear you suffer from arthritis my friend – I am so glad there have been improvements in medicine! Thanks Uru, yes there have been many advancements in medication but they are all so strong and have a zillion side effects. The tomatoes were very tasty. Gorgeous tart!!! A big slice for me, please!!! 🙂 I had no idea that you are suffering from RA. 🙁 I hope you can be treated soon and feel better. See ya next month! We’ll be in Colorado between the 9th and 13th. I will call you next week. I think my posts are still going to your spam box, aren’t they? I don’t know what else to do b/c some people have been receiving in their inbox. Well, take care. Thanks Denise! I’ve had RA for 13 years now and since its a chronic illness, I don’t think it’s going away. I try and manage it though as best I can. Hopefully I’ll get to see you when you come. Your tomato tart looks fantastic, I haven’t tried making GF pastry, I am curious to find out how it tastes! :-) Have to try it very soon! Thanks Tanja! Yes, it has become very difficult reading every package and ensuring its GMO free and even then like you said, are we sure that it is 100% GMO free. I hope one day we can all be confident in our governments and know that they have our best interests at heart. I’m sorry about your RA – I haven’t been a reader long enough to know that you’ve been struggling with this issue. That said, I love that you have a positive attitude and want to beat the problem through dietary changes rather than get bogged down by it. Bravo! It takes a lot to modify diet especially when you cannot always bring your entire family on board with the changes. Keep soldiering on! And the tart looks gorgeous. Thank you! Yes, it’s very hard to get the family on a regimen and that’s why I fail most of the time. It’s difficult because I love bread! I am lucky though that I don’t have an allergy to it and so can sneak in a taste every now and then. I too used to suffer badly with arthritis, and what made the biggest differences to me was cutting out all the nightshade family (potatoes, tomatoes, eggplant and peppers). That practically halted it in its tracks for me. Also keeping warm, a tablespoon of cider vinegar in a cup of water every morning and night (recommended by Sir Ranulph Fiennes). And losing lots of weight! Have made it disapear altogether… Couldn’t of dreamed for a better outcome 🙂 good luck. p.s giving up potatoes was the hardest thing ever but every now and again I sneak a taste… One day in a while is worth it, but could never go back. Tomatoes I can just about get away with now… Thank goodness! Hi Deborah! Thank you for commenting! I have read about the Nightshades too and do consciously watch how many I eat. It’s impossible to avoid the peppers though because having an Indian back ground, we have chilli in everything! I don’t think I could give them up or eggplants, or potatoes or tomatoes! !